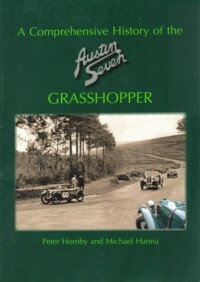 Of all the Austin Seven models produced over the years perhaps the Grasshopper model is the one most less known. 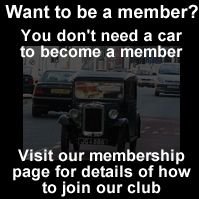 Many enthusiasts have never seen one, this reviewer being one! The Grasshopper had a brief life as a Work's car of only around three years from 1935 before being gradually sold off to privateers. Of a total of twelve cars built a surprising seven still remain and thus we are privileged to be able to enjoy their continuing successes. Despite the low production numbers the model has played an illustrious part in 750 motor racing and its history has now been very ably described in Peter and Michael's book, one which has taken several years of research and compilation. Comprising around 150 pages with well over 400 photographs, some in colour, the book comprehensively describes the cars, beginning with the technical aspects and then going on to detail the surviving cars. The chapter on living with a Grasshopper is interesting as Peter Hornsby is the proud owner of two survivors - a situation to be envied. The remainder of the book sets out the complete competition history of all the cars and is most detailed with numerous photographs. The book ends with short profiles of the drivers over the years. The authors complement each other, with Peter as an owner and Michael as a wordsmith and so achieving a very readable and well thought out layout. They are to be congratulated. The PWA7C is privileged to have had the opportunity to publish this work which will go down as the definitive history of this iconic model.